Lester is ready for FOURTHMEAL at Taco Bell. American's are fatter than they've ever been. No matter how much we hear about eating less and exercising more, our ears seem to be plugged. Now, a fast food giant is giving us one more reason to get fat. Taco Bell is promoting obesity with their FOURTHMEAL campaign. In 1999, there wasn't a single state in the nation that had more than 20% of its population categorized as obese. We've done some serious inflating over the last 12 years. Now, 49 states have obese populations of 20% or more. The only state under 20% was Colorado and they were at 19.8% (According to an NBC report.). We are fat and getting fatter by the hour. Health experts actually say that we should eat smaller meals more often, like every two to three hours. But I don't think they include fast food on the menu. We all know that you can knock back close to 1,000 calories with one fast food meal and a drink. Now, according to Taco Bell, eating three high calorie meals a day is not enough. We need FOURTHMEAL. I know they're going after the younger, late night crowd. But have you seen the kids we are producing these days? You need a wide angle lens on your smartphone to take a group shot of just three average high school kids. I live in a predominantly black neighborhood and there are people that look like they should have ropes on them and be flying above the parade on Thanksgiving Day. There are women here that have actually scared the crap out of me. I'm 6' 1" tall and weigh about 255 lbs. I'm technically obese, I think. But I'm a big, broad-shouldered guy and I carry it well. Or haul it well. However, there are black women here that are taller and bigger than me. Some make me look like a fetus. When your upper arms are bigger than my thighs, you gotta lay off the ham hocks, sista. I've lost about 20 lbs. over the last couple months. I was on a medication last year the blew me up like a balloon and I gained 60 lbs. in a matter of months. I'm working on getting back to my birth weight. It might take a while, but I have a goal. All I have to do is go to the grocery store and look at what is headed toward the register. I can almost guess the weight of the person who is buying the charcoal bag size of chips, 14 two-liter bottles of Mountain Dew, every fried frozen food you can purchase and a fifty pound sack of donuts. Let me guess, Macy's float? You betcha. Who needs a FOURTHMEAL now? If it's a bag of carrots or a salad, OK; but not a grease-laden, cheese-filled burrito, with sour cream and guacamole. Add that giant Coke and a belt buckle with Lester on it is about to pop. On Memorial Day, our town's parade ran right by the Dunkin' Donuts where I was working on my blog (love that FREE WiFi - and they give me FREE coffee all the time). Every fat freak-a-zoid was lined up out the door waiting to buy a donut and a drink filled with cream, caramel and topped with whipped cream. What ever happened to black coffee? Based on what I've seen and the statistics on how big our bellies are getting, I really don't think a FOURTHMEAL should even be on the menu. Does anyone fast? Oh yeah, my mistake, everyone FAST foods. McDonald's is putting apple particles in their Happy Meal. Like that is going to make a difference. America needs to wake up. Actually, American need to get off of their asses and walk. If you walk 10,000 steps a day, you won't have a weight problem. Take the stairs. Chase a dog. Park far away, like in the next county. Walk. Just don't walk to a fast food place. I feel most sorry for the kids. I saw a girl the other night that was just enormous. She had gone right past mom, who was a wide load, too. Parents with bad habits pass on those habits to their kids. The children are victims of the parent's laziness or ignorance. Medicine can only do so much to extend life span. Obesity, heart disease and diabetes are going to start pulling that number down the more we can't pull up our pants. 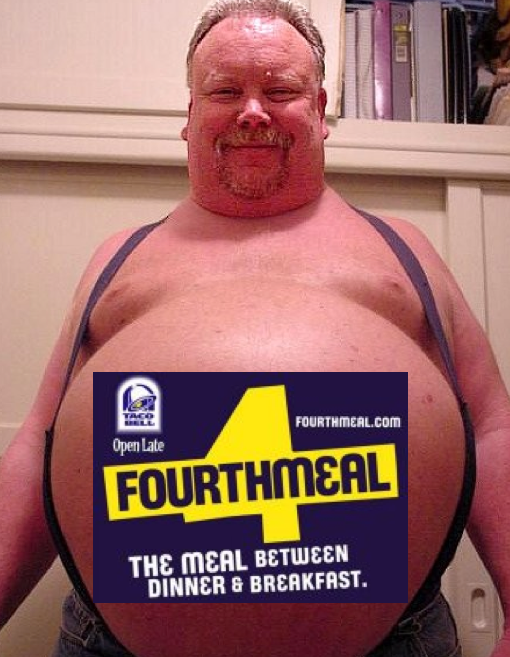 We need to turn a blind eye to the marketing and start making better choices because Taco Bell is promoting obesity with their FOURTHMEAL campaign. Do we really need it? Pare la grasa una (I hope that's right). Don't Fall Asleep With The TV On. You Could Have Very Weird Dreams.